We have been very fortunate in this part of the Breede River not to be affected by a water crisis and have no water restrictions in this area. This is where time slows down to give you the relaxation and peace you need for a restful stay. In summer cool off by the pool or enjoy a refreshing drink on the terrace, in the colder winter evenings warm up by the fire in the Dining room or Moxie’s Pub. Our meals included in the Dinner, Bed and Breakfast rate consists of a Full South African Breakfast and a hearty Table d’hote Home Cooked Dinner, try our selection of vintage wines to accompany your meal. 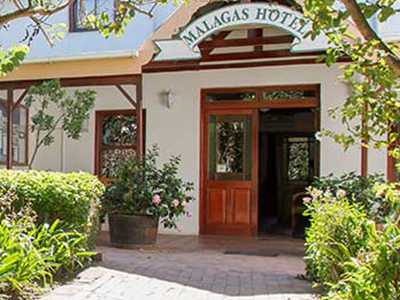 Malagas is 280km from Cape Town (approx 2 ½ Hours Drive). Take the N2 from Cape Town over Sir Lowry’s Pass towards Caledon. Approximately 6 km before Swellendam, turn right at the Malgas, Infanta turn-off. Follow the gravel road for 38km. Turn left at the Malagas Guest House sign, you will see the White Hotel Buildings on the left when you drive down the hill. Please remember, if coming from the Heidelberg side, that the “Pont” closes at 18h00. Once here you can’t miss us! Please note that if crossing the river with the Pontoon (Ferry) it operates between 06h00 and 18h00.